Welcome to Panda Pre-school playgroup, and our two drop in sessions - Sticky Mitts and Tiny Tots! We have been at the heart of Copmanthorpe village for over 30 years. We are a registered charity, run by a voluntary committee of trustees mainly made up of Panda parents and carers. Our different sessions provide local pre-school children with an exciting journey of learning through play from birth to school. We aim to help parents find somewhere safe and welcoming to come and have fun with their children, meet other parents and get a taste of what Panda pre - school Playgroup has to offer. 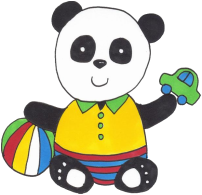 To find out more about Panda Playgroup, please visit our Panda section. Our Tiny Tots and Sicky Mitts sessions are drop-in Baby & Toddler Groups run by Panda pre-school Playgroup. Each week, during school term time, we hold three sessions (on Mondays, Tuesdays and Wednesdays) at the Methodist Church Hall in Copmanthorpe from 9.15 – 11.15 am. These sessions are £3 per adult and child, plus £1 for each extra sibling that comes along, and this includes a healthy snack for your child and a hot drink and biscuits for you! NEW! My Baby Can Dance! ​From September 11th 2018 every fortnight, at no extra cost. If you love the session why not come along more than once? Enjoy a reduction for a second visit in a week. Find out more about our sessions and which days they run by clicking on the pandas below.